This is one of the largest pins I have seen. Measuring 3" x 4". 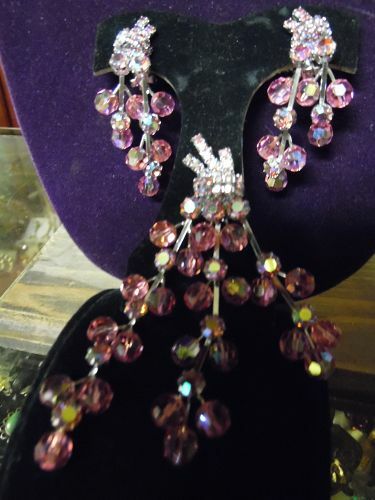 The marquis and round stones are a pretty aurora borealis champagne pink, and are all prong set. 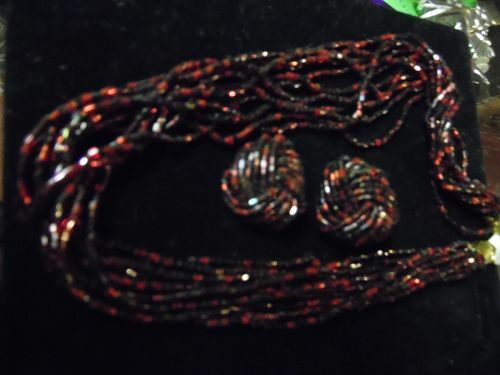 The earrings have clip backs and are 2" long. 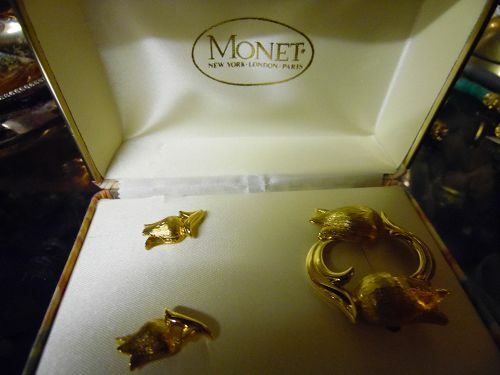 The set is in exceptional condition. 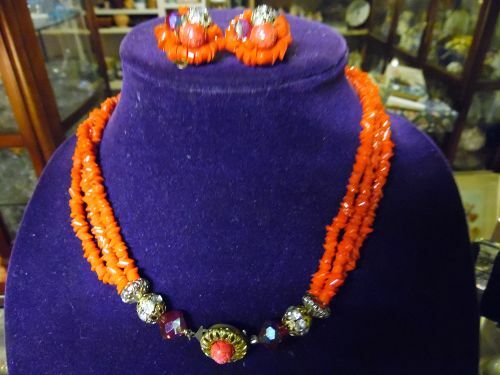 The photo does not capture the true color. 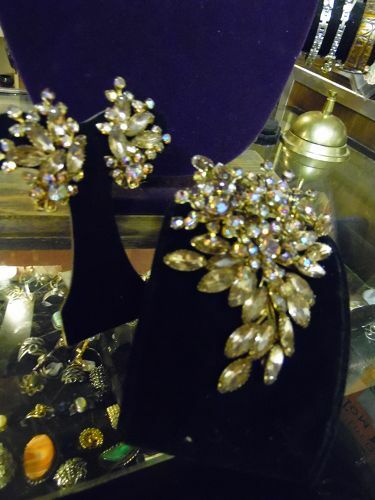 This vintage pin and clip earring set is truely magnificent. 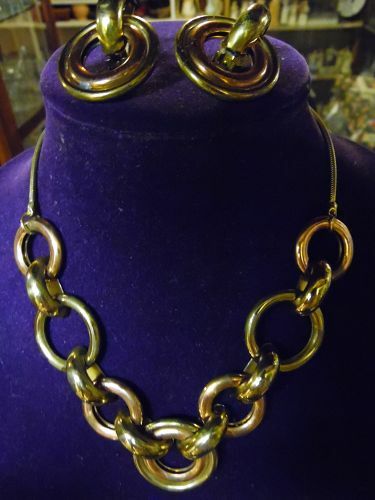 No makers mark, but it is beautiful and unusual. 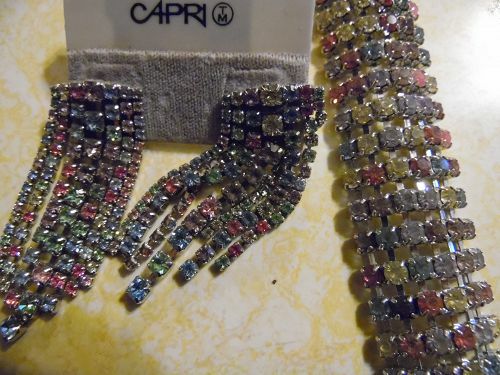 Pin measures 4" long and each spray hangs independently for nice movement and shimmer from the pink aurora borealis beads and rhinestones. 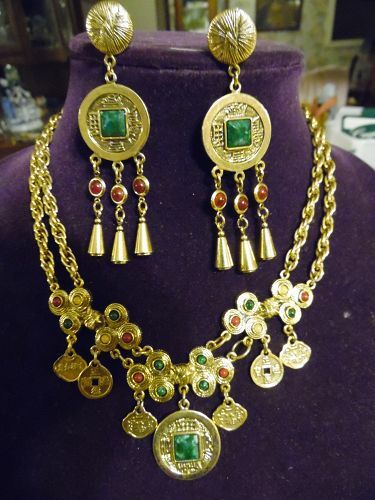 The earrings are the same and will shimmer with the slightest movement also. 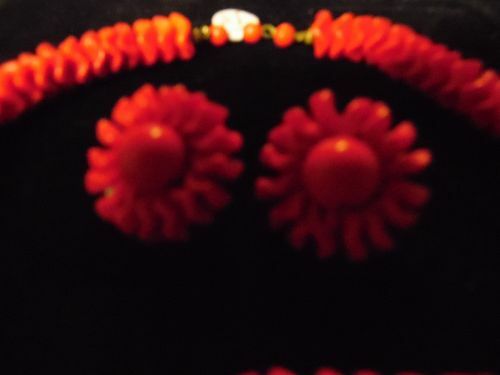 The earrings have clip backs and measure 2 5/8" long. Silver tone settings and the set is pristine!!! 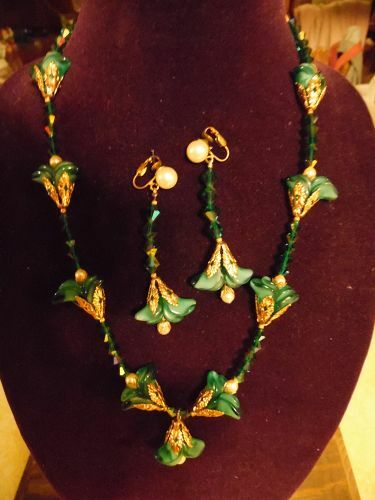 The picture does not do this set justice. 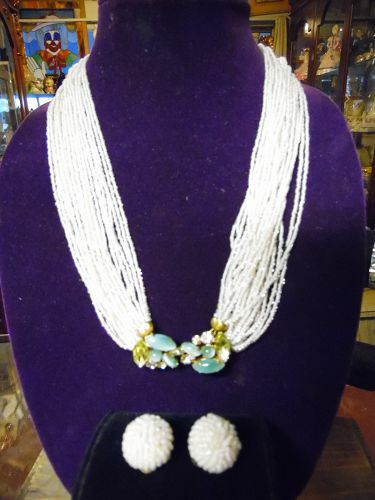 Magnificent Beaded, Chain Link Necklace Designer Signed "Trifari". 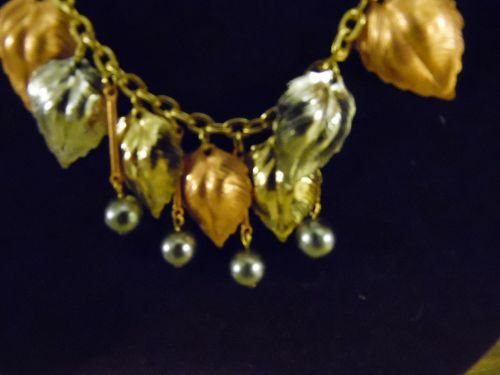 Vibrant Purple Beads Gold Tone Detailed Leaves & Chain. 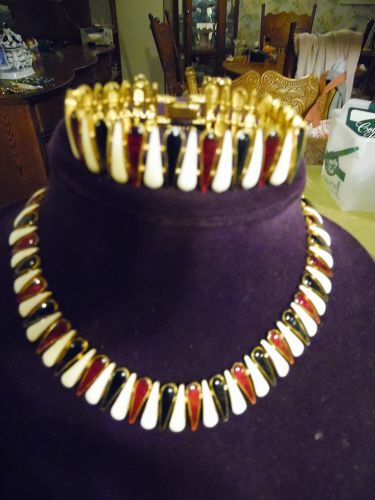 Necklace Measures 30" Long (Shown doubled in photo), also including the 1 1/4" round earrings with post backs on the original card and matching bracelet. 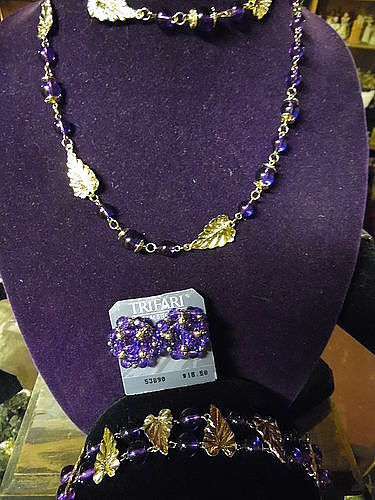 This is a stunning set in a beautiful Purple highlighted by the shiny gold accent leaves and beads. Absolutely Gorgeous!!!! 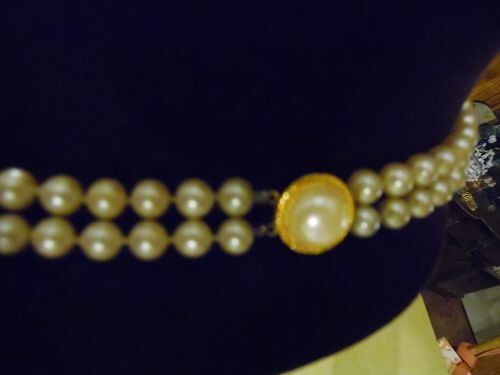 !In Excellent Condition, never worn.